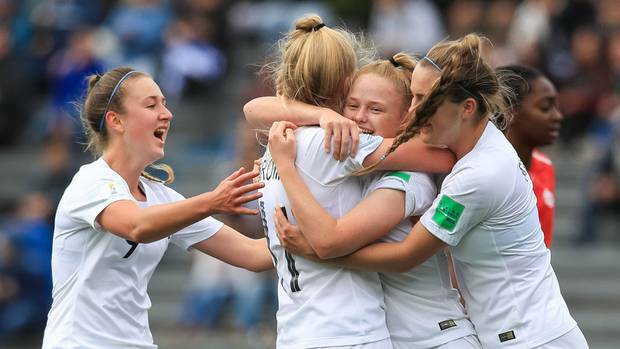 The New Zealand team managed to score the fastest goal of the Women’s U17 World Cup in Uruguay, thanks to the goal of forwarding Grace Wisnewski in the first minute and managed to get the bronze for the first time after beating Canada 2-1. The ‘Kiwis’ did not wait much and at 19 seconds forward Grace Wisnewski, 16, scored the first goal of the match. A minute later, Canada was close to getting a draw from outside the box, but it was cleared by goalkeeper Anna Leat. The advantage obtained by the ocean was no excuse to relax and the ‘young football ferns’ continued to press without giving respite to Canada. The second goal of the New Zealanders did not wait and the 13 minutes Wisnewski took the double with a right that beat the Canadian goalkeeper Anna Karpenko. The goal that was the result of a collective movement of the ocean. The Americans did not give up and began to move closer and closer to the New Zealand goal, especially the forward and top scorer of the Jordy Huitema team. But none of the shots were fruitful. After some changes, Canada put all the meat in the spit in the second half, focused on the attacks and after a few minutes tried to get the first goal with a header from captain Huitema, but the keeper ‘kiwi’ broke the attempt. Wisnewski returned to shoot at goal to get his third goal of the match – fourth of the tournament – but he miscalculated and the ball hit the post. Canada’s aggressive play came in the 64th minute when Lara Kazandjian scored a tough target after dodging the opposition and firing with the left to the goal. The entrance of the Americans to the game made the New Zealanders nervous and increased the morale of the Canadians. Meanwhile, Caitlin Shaw was close, several times to get the tie, but could never score the desired goal. 2. New Zealand: Anna Leat; Mackenzie Barry, Hannah Mackay-Wright, Aneka Mittendorff; Marisa Van Der Meer, Macey Fraser (m.55, Maya Hahn), Gabi Rennie (m.75, Britney Cunningham-Lee), Amelia Abbot, Grace Wisnewski; Maggie Jenkins and Kelli Brown. 1. Canada: Anna Karpenko; Julianne Vallernd (m.46, Ariel Young, m.87, Sonia Walk), Maya Antoine, Jade Rose; Caitlin Shaw, Lara Kazandjian, Jayde Riviere, Wayny Balata; Andersen Williams (m.46, Jessica de Filippo), Jordyn Huitema and Kalia Novak. Goals: 1-0, m.1: Grace Wisnewski. 2-0, m.13: Grace Wisnewski. 2-1, m.64: Lara Kazandjian. Referee: The German Riem Hussein. Aneka Mittendorff (m.33), Mackenzie Barry (m.84) and Kelli Brown (m.91). Incidences: corresponding match for the third place of the Women’s U17 World Championship that takes place at the Charrúa stadium in Montevideo.